Do you want to know about Karimunjawa Islands? Let's Travel to to Karimunjawa Islands - Indonesia. Karimun Islands is a cluster of 27 islands located in the Java Sea. 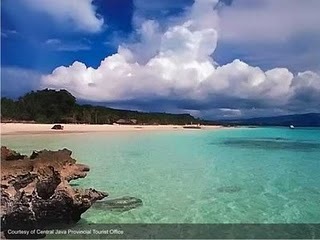 The islands are all included in the Sub Publications, Jepara, Central Java Province. In general the islands is lowland tropical forest, and only 5 islands inhabited by the population, namely the island of Karimun, Kemujan Island, Parang Island, Mosquito Island, and Island Genting. 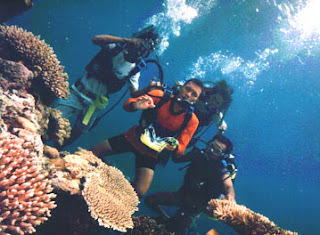 Since March 15, 2001, Karimunjawa set by the government as a National Park Karimunjawa. Karimun island has an area of ​​111,625 hectares, consisting of 1507.7 hectares of land, and waters of 110,117.3 hectares. Based on the legend that developed in the surrounding community, Karimun Jawa was discovered by Sunan Muria. The legend tells about Sunan Muria concern over juvenile son, Amir Hasan. For the purpose of educating, Sunan Muria then ordered her son to go to an island that appears "kremun-kremun" (escape) from the summit of Mount Moriah for the child to deepen and develop the science of religion. Because it looks "kremun-kremun", Sunan Muria then gave the name "Karimun" for the island. With beautiful natural conditions and beautiful, Karimunjawa offers natural attractions are truly captivating. Not excessive for the government would establish the region as a national park Karimunjawa because this area does have a wealth of flora and fauna is extraordinary. Publications have some type of flora, namely coral reefs, mangroves, coastal forests, and lowland forest. While the wealth of fauna consists of long-tailed deer and monkeys as well as aquatic fauna that consists of 242 species and 133 genera of ornamental fish, aquatic. In addition, at this location there is also a rare species of fauna berhabitat at Bird Island and Island Geleang, such as the sea eagle and white chest and two types of turtles, namely hawksbill and green turtles. In addition to its natural wealth, privilege Karimun Jawa can also be seen from its cultural wealth. Therefore, these islands are inhabited by people with diverse ethnic backgrounds. Inside are a resident of the Javanese, Bugis, Makasar, and Madura. Java Community Karimun many live in Hamlet, Hamlet Legon Lele, Nyamplungan Hamlet, and Hamlet Mrican. Much of their livelihood is farming and making household industries, such as red brick and coconut oil. Community Bugis and Makassar people are located on the island Kemujan, Hamlet Batu Lawang, Legon Gede Hamlet, and Hamlet Tlogo. Bugis society known as an accomplished sailor, and therefore most of its people living as fishermen. In addition, the Bugis is also popular with craft gloves tenunnnya a great demand by the tourists. Almost the same with society Bugis, Madurese community was mostly work as fishermen. However, they have the ability to make dry fish that can not be done by other tribes. With a diverse ethnic background, people in Karimunjawa still able to keep and maintain social harmony among them. They have the tradition or some kind of local wisdom in the form of mutual exchange of goods (goods for household consumption or craft) made by ethnic groups living in this region. Karimun Islands, located in District Publications, Jepara, Central Java Province, Indonesia. The trip to Karimun Islands can be reached by sea and air lines. If using sea routes, Karimunjawa can be achieved through the Port of Tanjung Mas Semarang and Jepara through the Port of Kartini. From the Port of Tanjung Mas, Semarang, visitors can use a motor boat Kartini I, departing every Saturday, at 9:00 pm and Monday at 7:00 pm, at a cost of USD 108 000 for business class and $ 128,000 for executive class. Meanwhile, if taken from the Port of Kartini, Jepara, visitors can use a motor boat Muria which departs every Saturday at 9:00 pm, and Wednesday at 9:00 pm, at a cost of Rp 63,000 for business class and $ 83,000 for executive class (April 2008). Meanwhile, for visitors who use the air route, the trip can be started from Ahmad Yani Airport, Semarang, with 212 leased aircraft types Cassa provided by PT. Sea Tourism Nusa Permai (Tortoise Resort). Travel time approximately thirty minutes from Ahmad Yani Airport to the airfield Dewadaru, Karimunjawa. Entrance fee is included in the cost of travel, whether using sea routes, and air lines. Karimun islands in the tourist areas there are accommodation facilities and complete facilities, such as hotels, lodging houses, restaurants / eating houses, mosque / mosque, fruit stalls, souvenir stalls, and others. In addition, in the tourist areas there are also nautical sports equipment rentals, such as fishing equipment, diving, swimming, and sea cruisers equipped with glass on the bottom (glass bottom boat) that serves as a place to see the beauty of the underwater ecosystem. At tourist sites are also available inter-island transportation, which will deliver visitors to enjoy the beauty around the existing group of islands in Karimunjawa. Transportation facilities are part of the tour that uses a motor boat rental. Rates are valid (data in 2007) ranging from Rp 250.00 to Rp 450,000 depending on distance traveled and duration of use. Travel attractions in Karimun Island was less complete if visitors are not visited marine aquarium facility located Menjangan Besar Island. On the island, visitors can enjoy the beauty of ornamental fish and shark's life as well as other fish with a nuance that can not be found elsewhere.